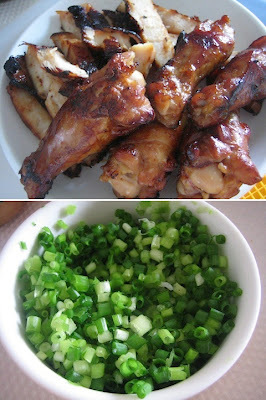 Sharing my invented barbecue marinade (based on tips from here) so you don't copy it since the barbecue ended up being too salty. :D Next time I'll use less soy sauce. Will post an updated recipe once I have one. I invented this. Sarap naman. I used instant spice mix from the supermarket. Can't believe I don't have a photo of the cooked chicken! Anyway, please settle for photos of the spice mix and the grilled vegetables. I used 3 types of mushroom for this: enoki, eryngii & fresh button mushrooms.